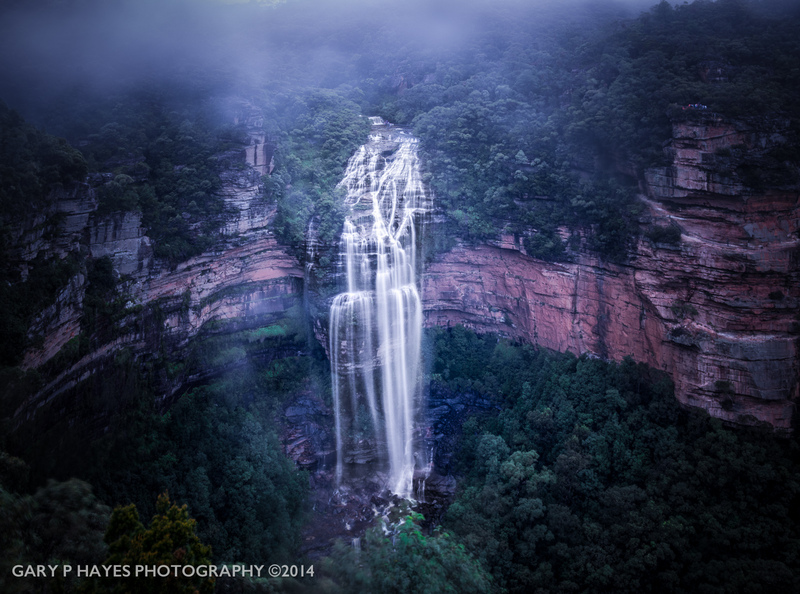 ABOUT: A stunning view back up the main Wentworth Falls and smaller falls at the base of the first big drop, great with mist and after a downpour for 2-3 solid days before. The trail down and across to Valley of the Waters is a photo op too, but you can just go to base of WW falls and come straight back up the cliff steps. But as you have to climb out of the valley anyway, coming up at the other end through another 5 waterfalls in the Valley of the Waters, makes it an all day photographers treat. PHOTO EQUIPMENT TO BRING: The falls are enclosed and very steep so a perspective lens, ultra wide if you want the whole thing – or do a stitch vertically with several shots. For smooth water a tripod, but you can handhold as it is often lit up very well. Lots of nice ops on the lower mini falls too. GETTING TO THE SPOT/S: This is a very well marked trail from the car park and I have managed to get to the midway point of the falls and back out in under an hour if you want just this view. Consider a diversion to weeping rock falls before or after. Also the steps down are fantastic for valley views, but gruelling on the way back.